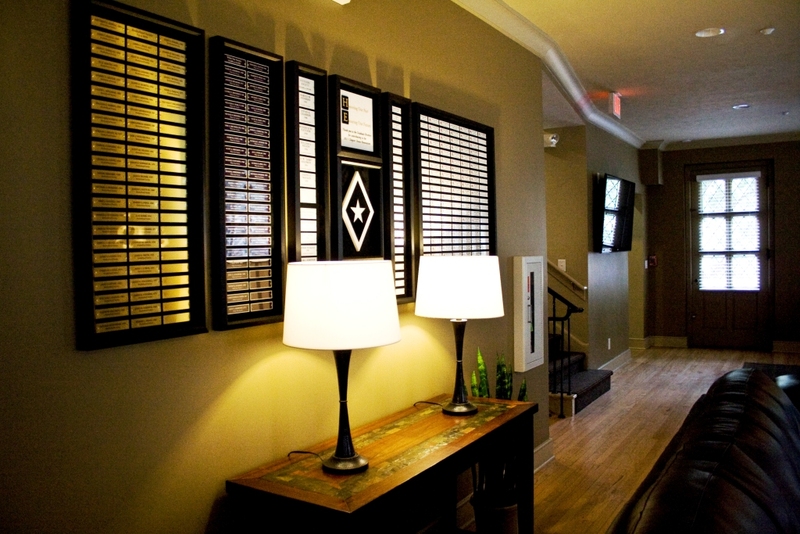 Thank you Graduate Brothers — the new donor wall has been installed in the living room. Nearly eight months to the day that the first wall came down, the chapter house project is done. 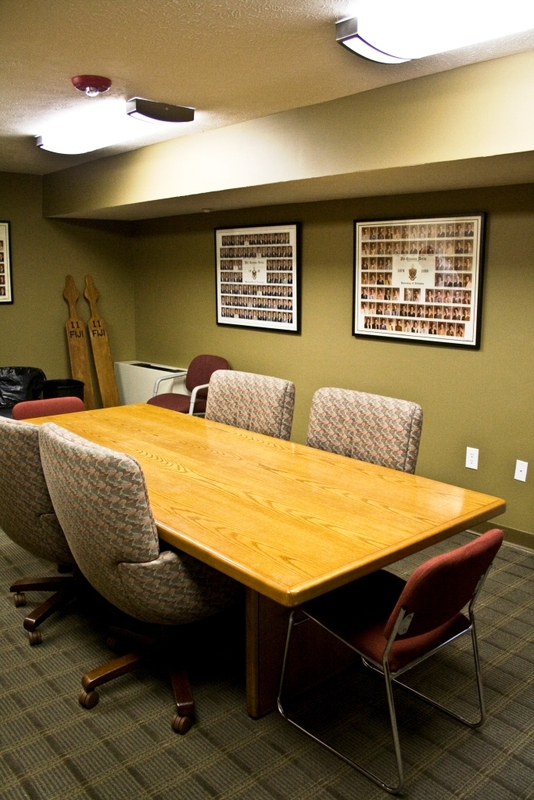 Lambda Nu is the one of the safest and most modern fraternity houses at the University of Nebraska. 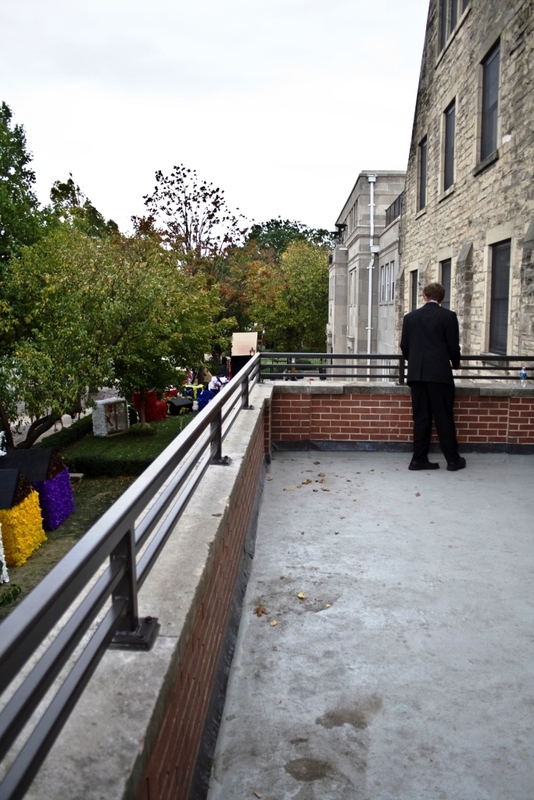 A few last-minute projects included replacing the patio area directly in front of the 1931 building and adding a railing to the 1964 addition to bring the building into current safety codes. A new front door was installed last week and landscaping will go in on Monday. The house corporation is still accepting donations (the final construction bill is coming in at $1.6 million). Visit the How to Donate section for information on donating. The completed living room — looking into the study room. 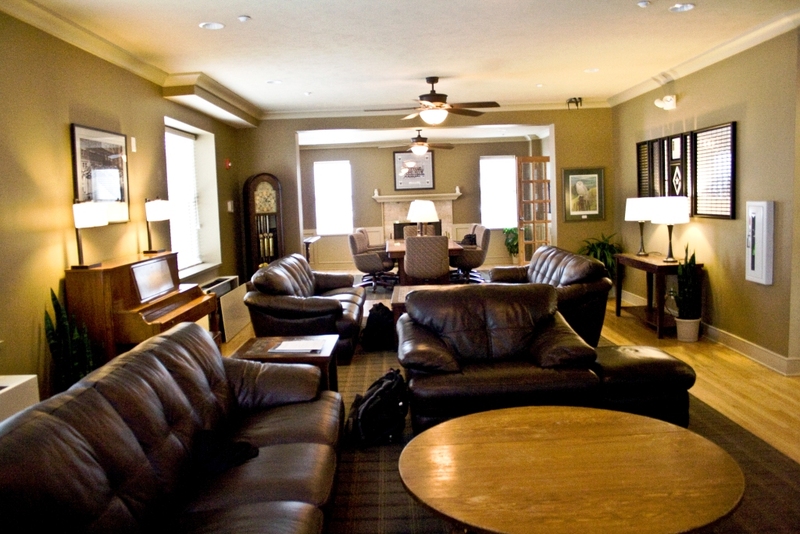 The furnishing include new leather couches and chairs, side tables and art work (historical photos from Lambda Nu’s archives). 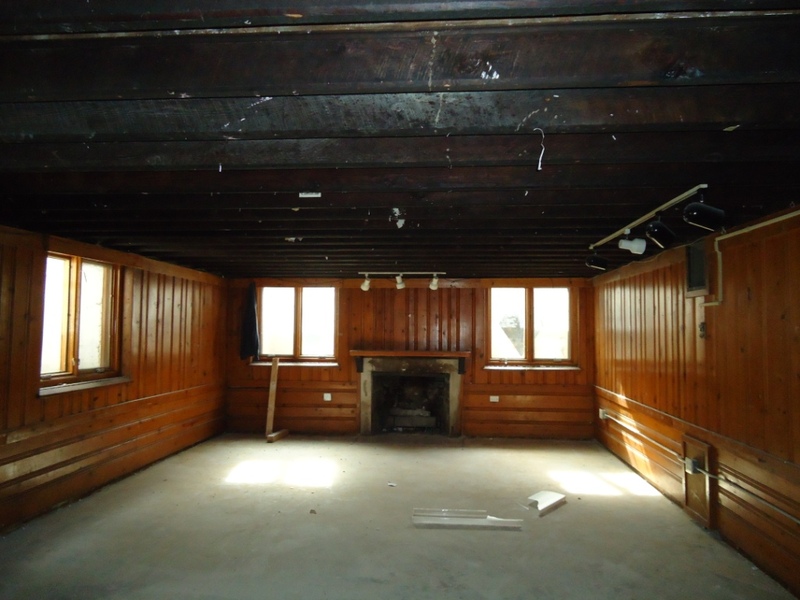 The House Corporation was able to save the coffee table, piano, grandfather clock and library table. Study room at the back of the living room. The conference table was acquired a few years ago and is heavily used resource in the chapter house. The chapter awards line the walls and the 1936 pledge class photo hangs over the fire-place. 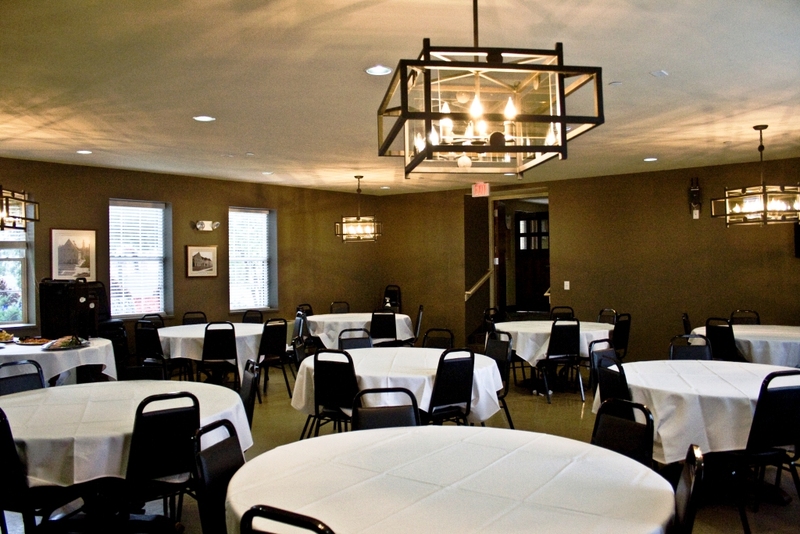 The dining room features new chandeliers and is painted in a darker tan with a green hue. Lambda Nu’s former homes are featured on the walls. The original dining room tables were refinished for years of future service. 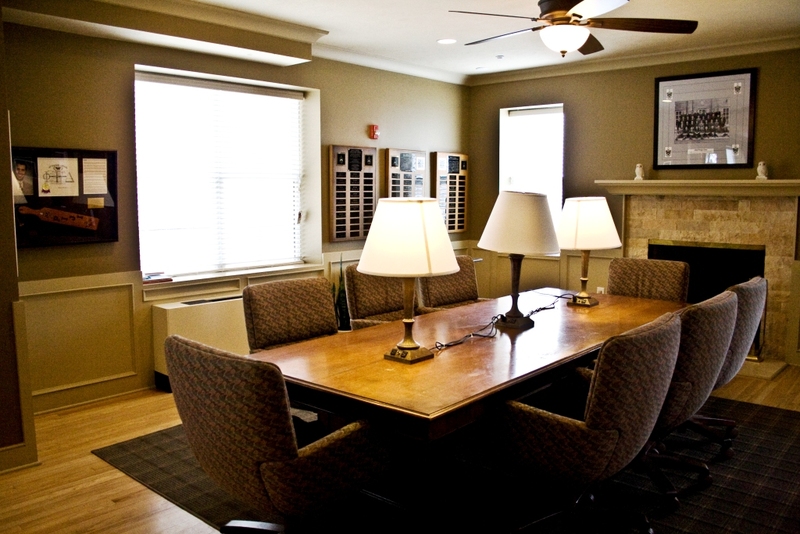 The room formerly known as B2 has been made into the Andersen Study Center and features a large study tabel and desks for students to complete homework. The old door that use to exit to the parking lot was blocked and filled in. 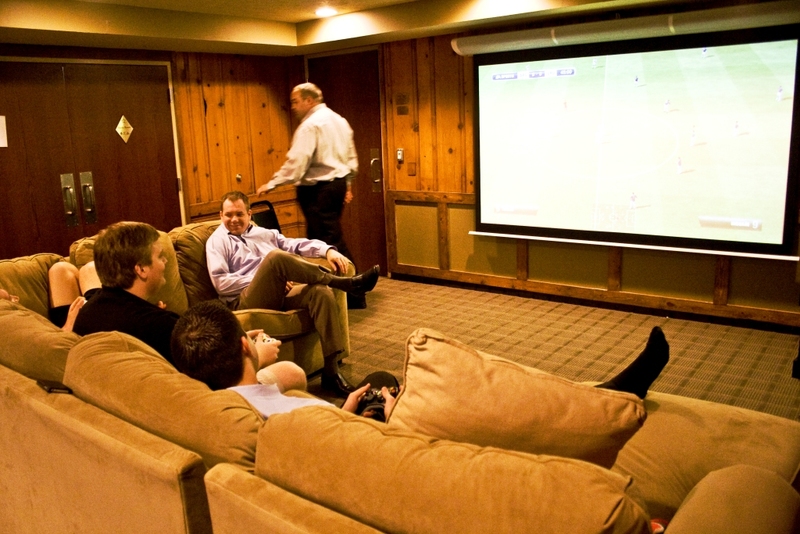 A ‘small’ television was added in the basement for brothers to gather and watch the big game on the big screen. The back of the old diamond room now features of pool table, complete with purple felt. 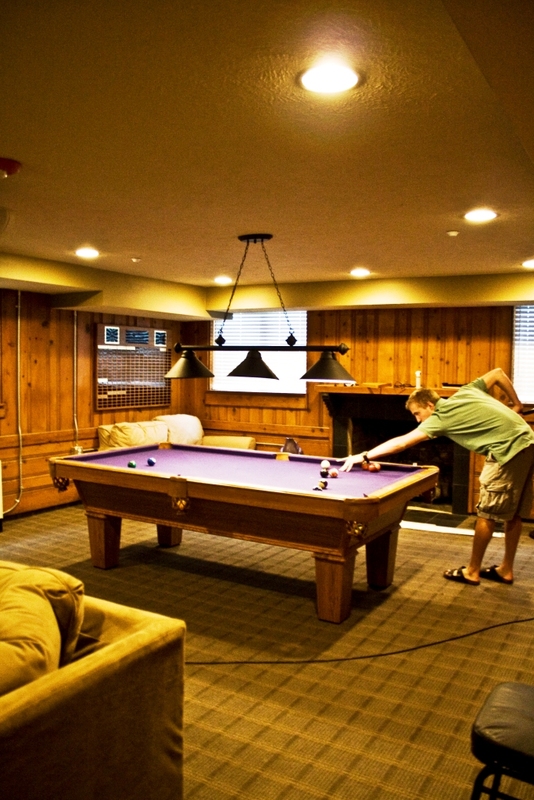 Several pool tournaments have already been held and this area is one of the most popular gathering places in the chapter house. 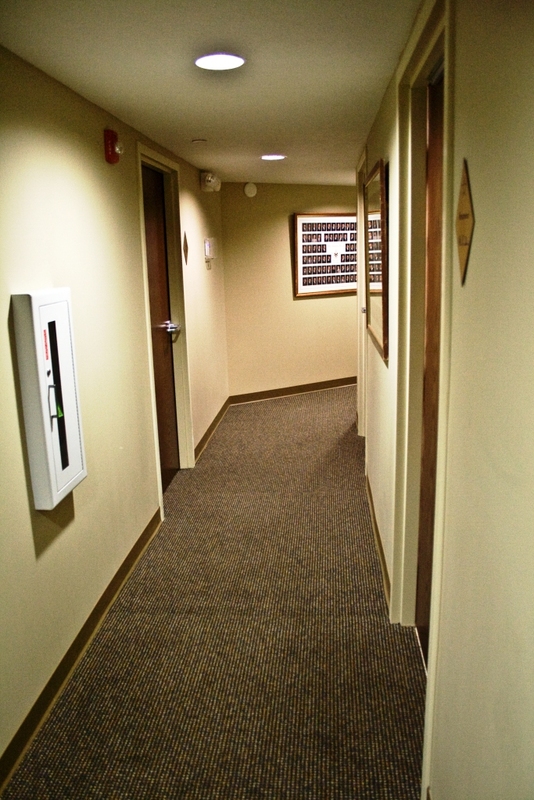 The hallways now feature composites. This hallway is 2nd old. A new railing has been added to the balcony to bring it to current building codes. 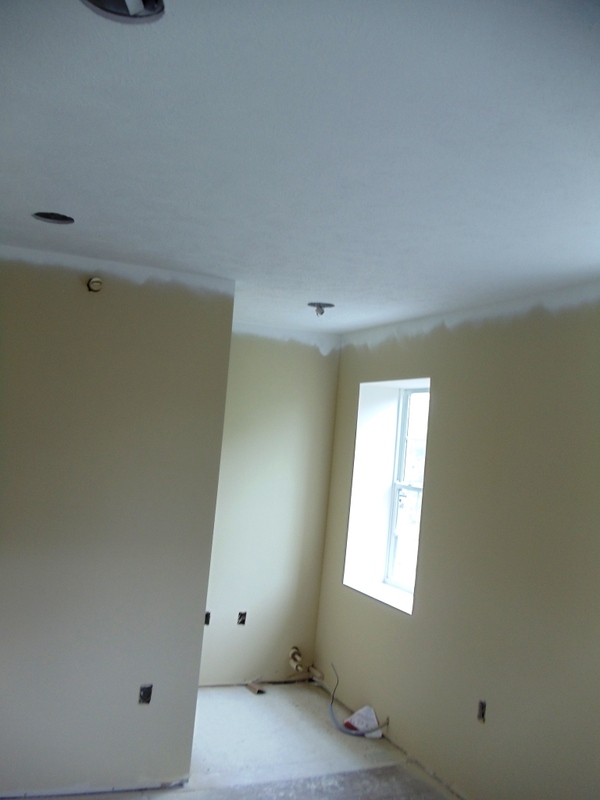 In addition, the floor was pitched and sealed to prevent leaking in the foyer below. When you start an extensive project – you expect there to be issues that will have to be addressed. 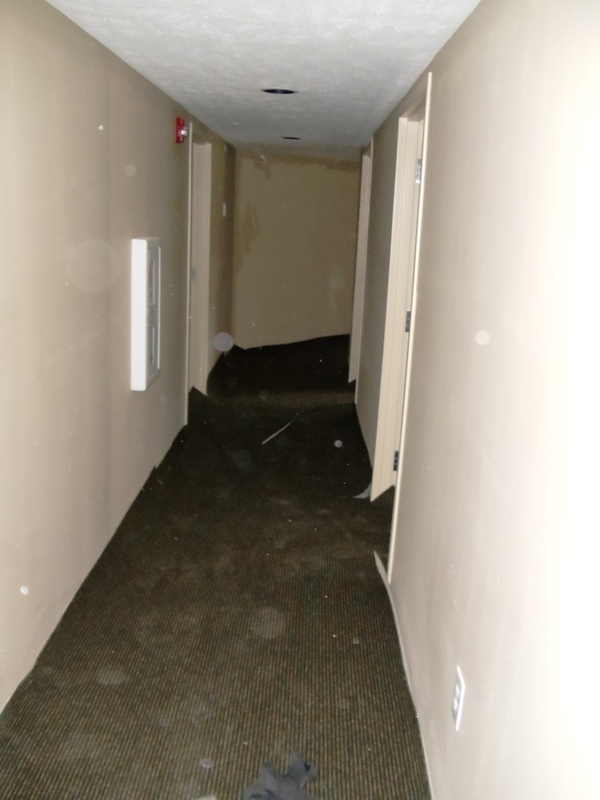 Sure, we knew there was asbestos that needed to go, fire sprinklers had to be installed even a few ADA issues that would need to be addressed – but, we did not know that we would have to install special windows on the fire escape. These fire-rated windows are specially designed to contain a fire inside the building. In addition to the new exit doors on each floor, these help ensure the safety of our Brothers in the event the building would need to be evacuated. 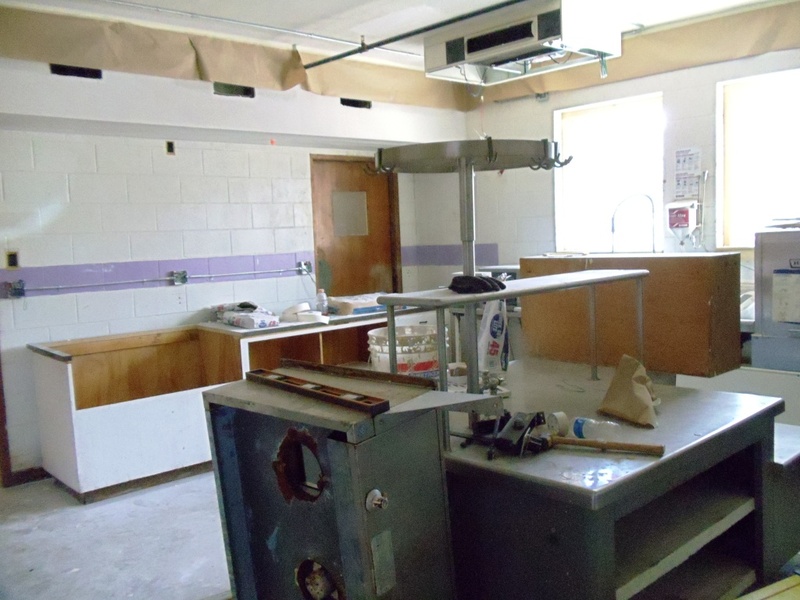 Let’s just say, they cost a pretty penny – but, like the asbestos, it had to be done. 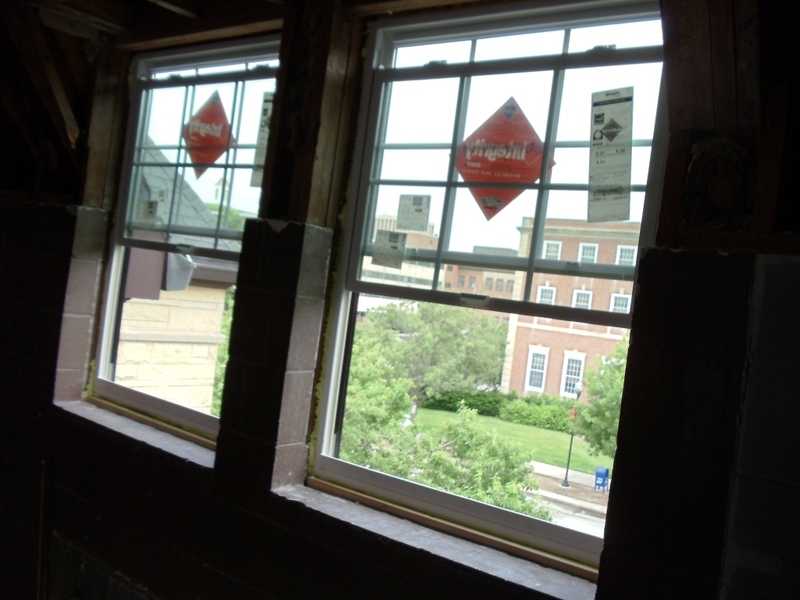 New windows were installed in the 1964 addition on 2nd and 3rd floors. With these energy-efficient windows and all the new insulation, the chapter should save hundreds (if not thousands) of dollars each year in energy bills. Last school year, the electricity bill ran between $1,000 to $1,400 a month and gas was $600 (without the boiler) to $3,000 (with boiler). It will be interesting to see how much these decrease. Painting started on the 1931 side of the building this week. All rooms are being painted the same color. To help keep the property looking nice for years to come, the house corporation is making several changes to the rental agreements – one of them being that undergraduate brothers will no longer be able to paint their room. 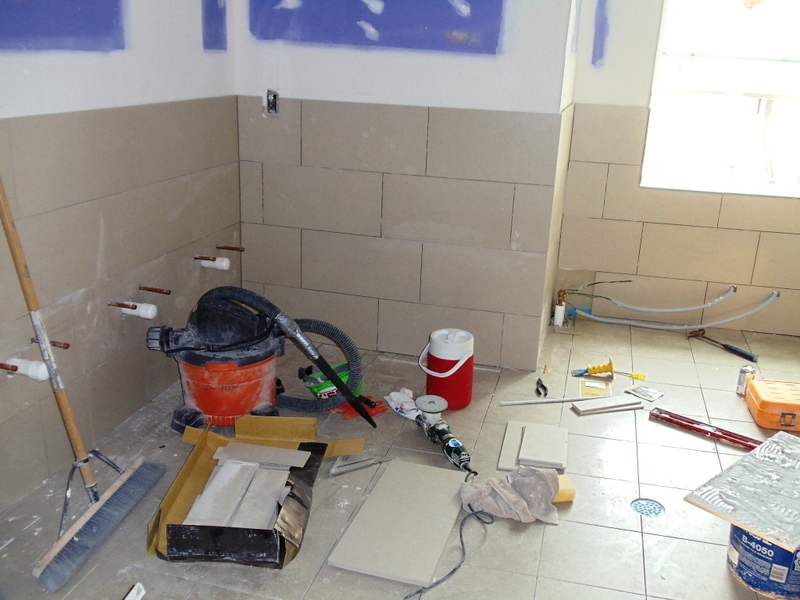 The tile is down in both ‘old’ bathrooms and rough-in work continues in the ‘new’ bathrooms. 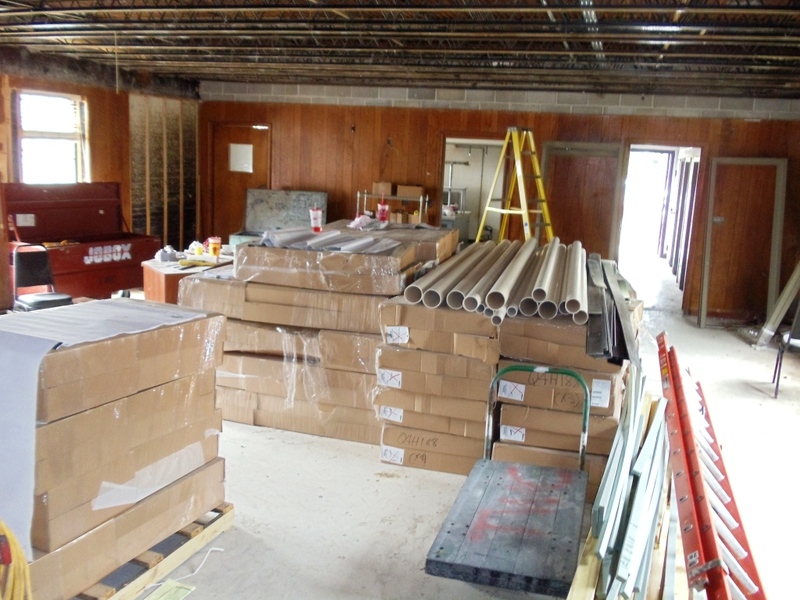 Rooms will be heated and air-conditioned using fan coil units, which arrived this week and will be installed on the 1931 side over the next few weeks. New windows installed in the 1964 addition. The 1st floor windows will go in next week. A fire-rated window is ready to be installed in room 209 (was room 210). Any window within 10′ of a fire escape must be fire-rated. 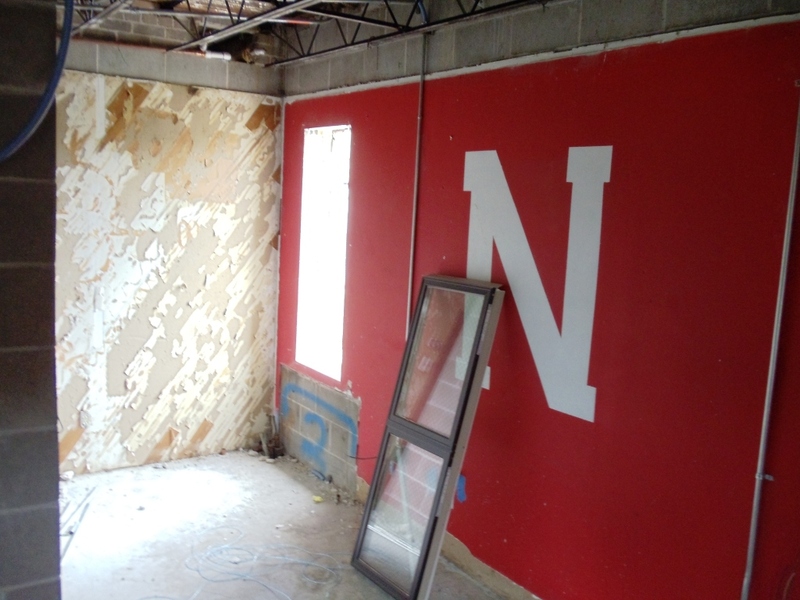 Painting has started in the 1931 building. This is room 300.A (north side of old room 300) and will be a sleeping room. New windows in room 310 (was room 312). Tile work is nearly done in the 3rd ‘old’ bath. 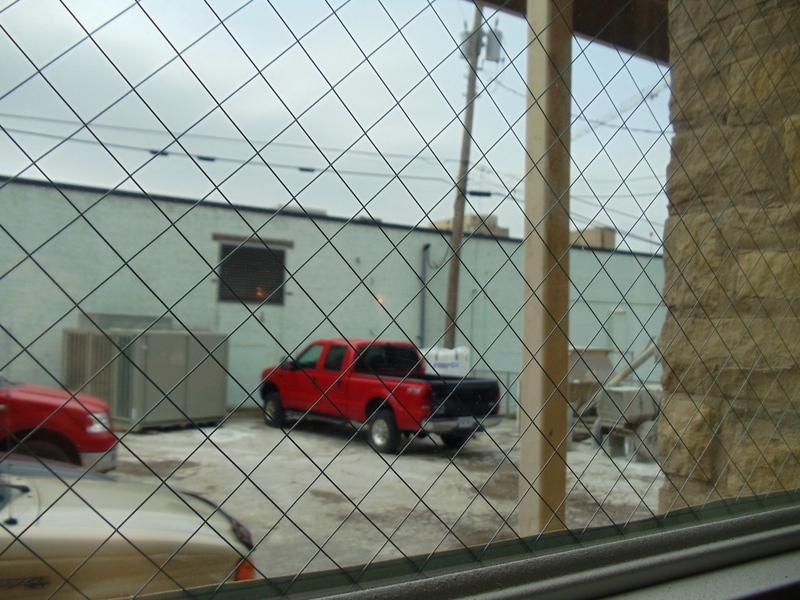 Rough-in’s continue in the ‘new’ bathrooms — this is 2nd new — standing at the door — looking to where the toilets use to be located. Boxes of fancoils are stored in the dining room. 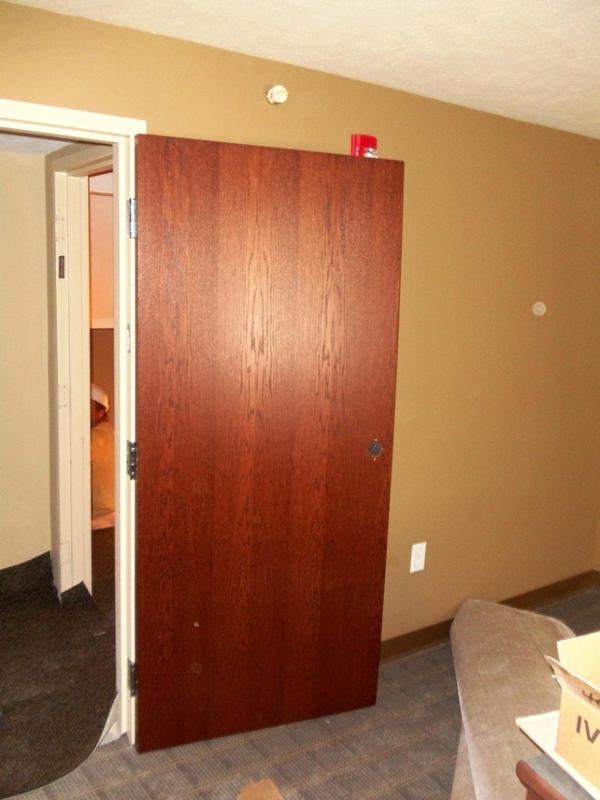 Bye-bye old door out of what was room B1 — it has now been bricked up. 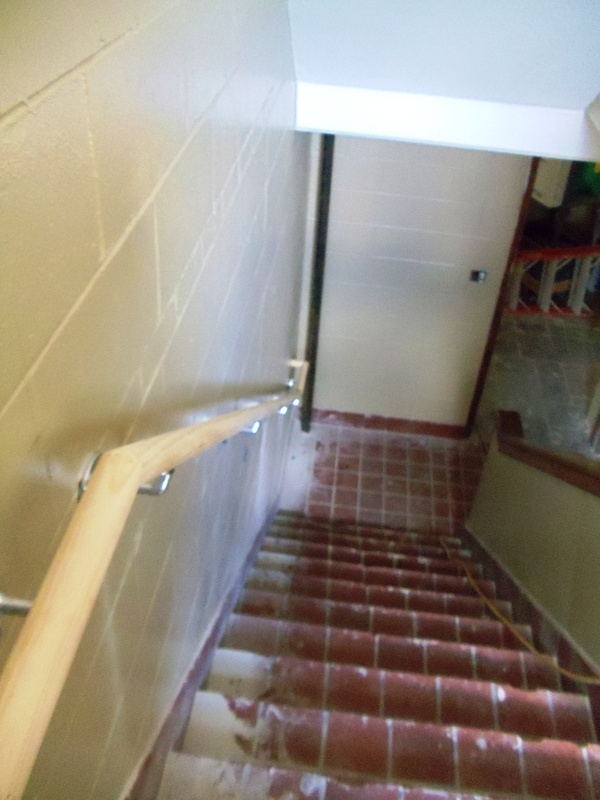 The stairs are scheduled to be removed when the new pad for the air conditioning equipment is poured. We get to keep the railing! 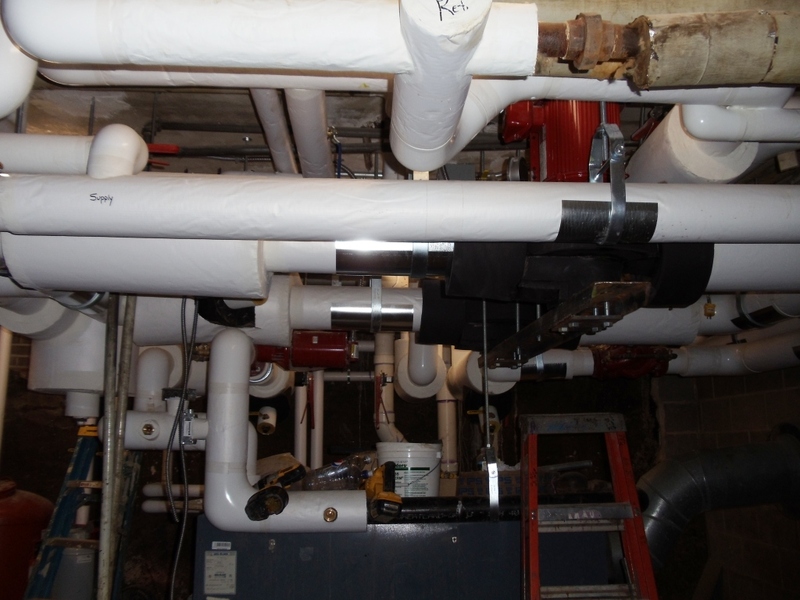 One of the ‘fun’ aspects of a major remodel project is that everything has to be brought up to current building codes. One of the code requirements we didn’t think about was the height of the wrought iron railing. 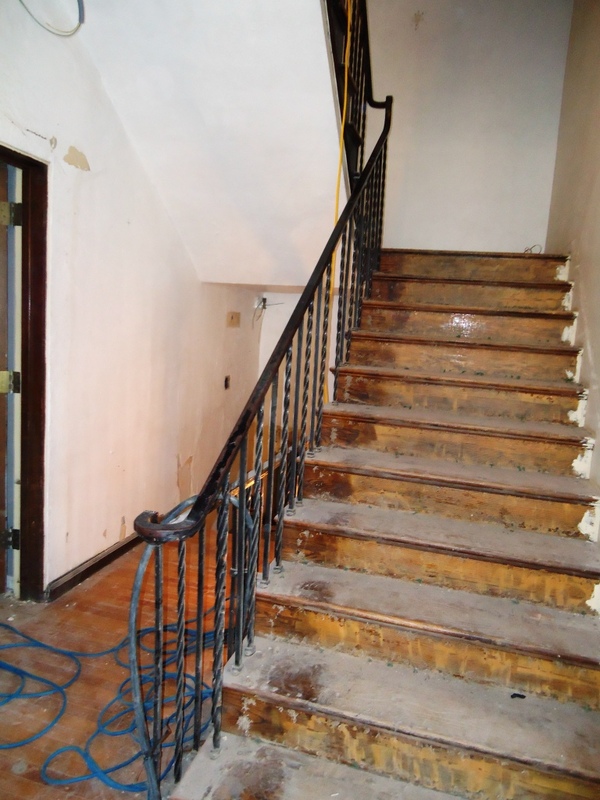 This original 1931 railing goes from the basement to 4th floor – and is not high enough to meet current code. Thankfully, the City of Lincoln recognizing that the primary user of this railing is young men in the prime of their life, we received special permission to keep the existing railing. Unfortunately, we are not as lucky in a few other areas. 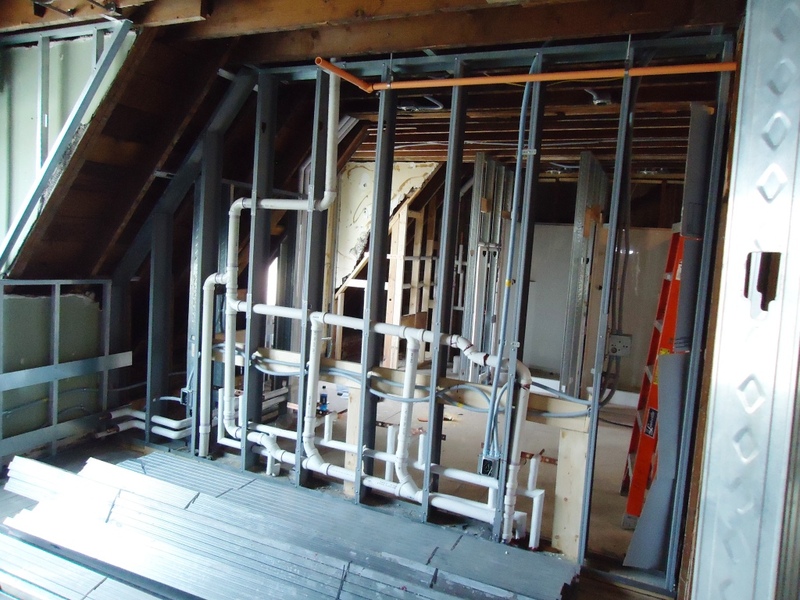 Due to the various bathroom remodels over the past 80 plus years – some of the bathroom floor joist had significant notches cut in them to accommodate plumbing. While a new 2 x 12 has been placed next to the old joist, the city wants our engineers to review to ensure they are structurally sound. 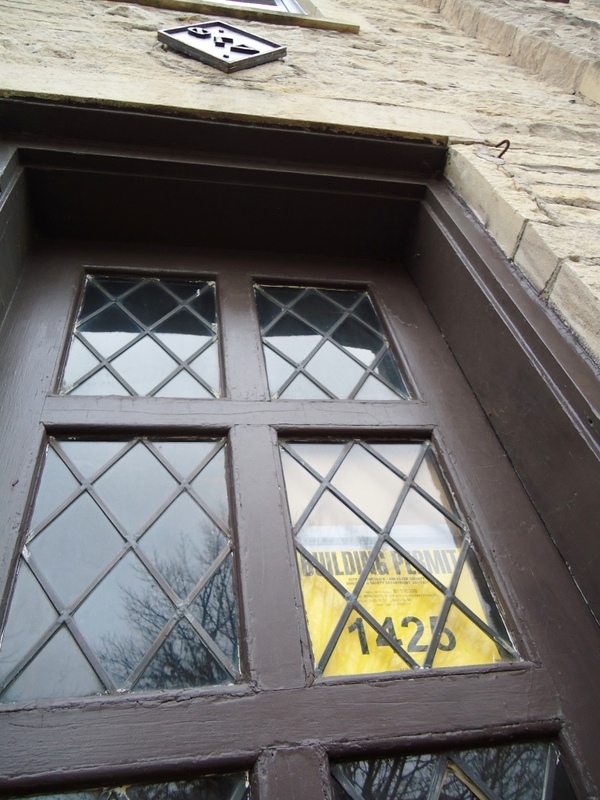 We’re also waiting to see if we will have to install the special fire rated windows next to the fire escape…stay tuned. 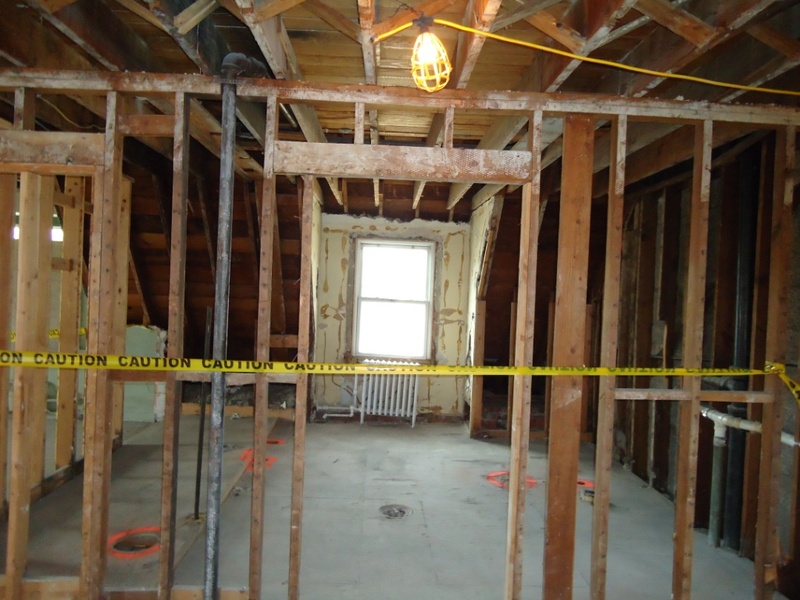 If we are able to resolve these issues – insulation and drywall should start next week. The plumbing rough-ins for 3rd old bathroom sinks. 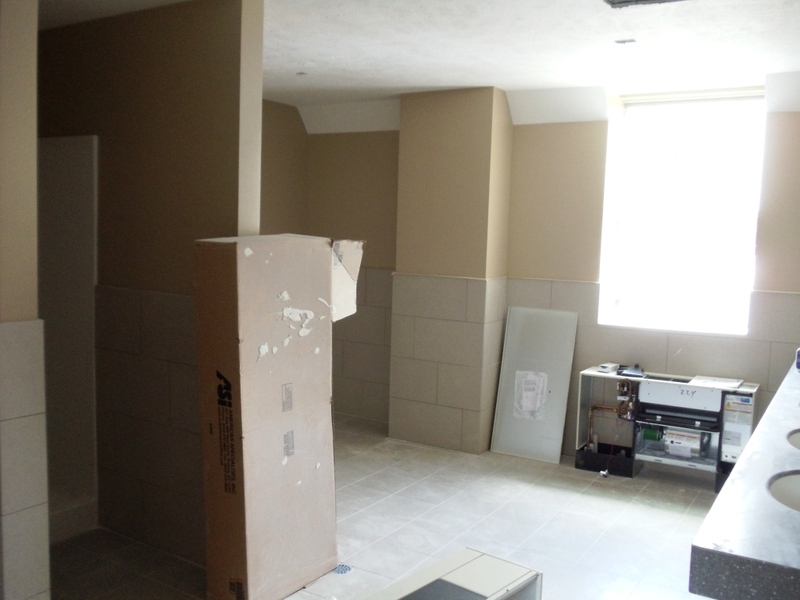 The sinks will be on the south wall — where the showers were located. 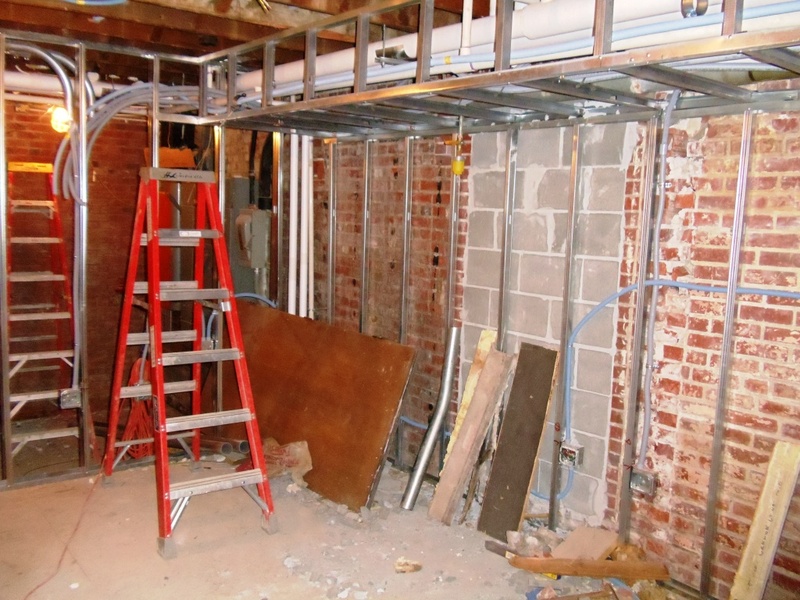 The rough in for the new washer/dryer on second floor. This is in the hallway between the old and new side of the building. the floor is being built up in what was the bedroom area of B1. 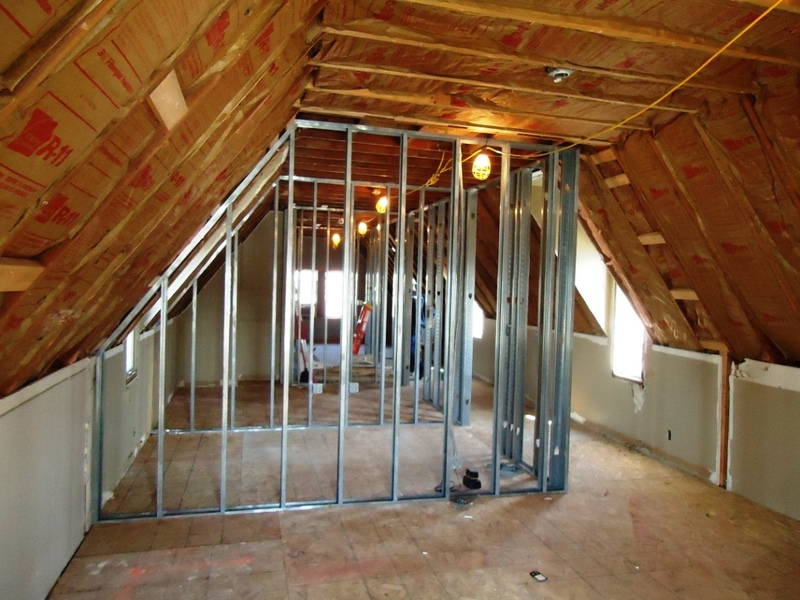 This will be a new study/computer room. The west door that leads to the back lot will be removed and the stairwell filled in as the electical service is updated to the building. Late last week we received our building permit from the City of Lincoln. 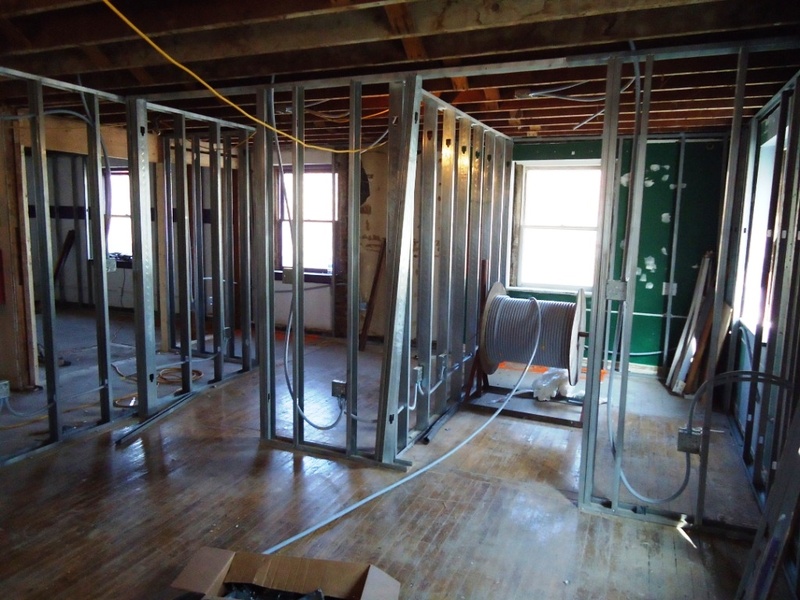 This week the contractors are finishing up the electrical and plumbing rough-ins to allow for insulation and drywall can start next week. 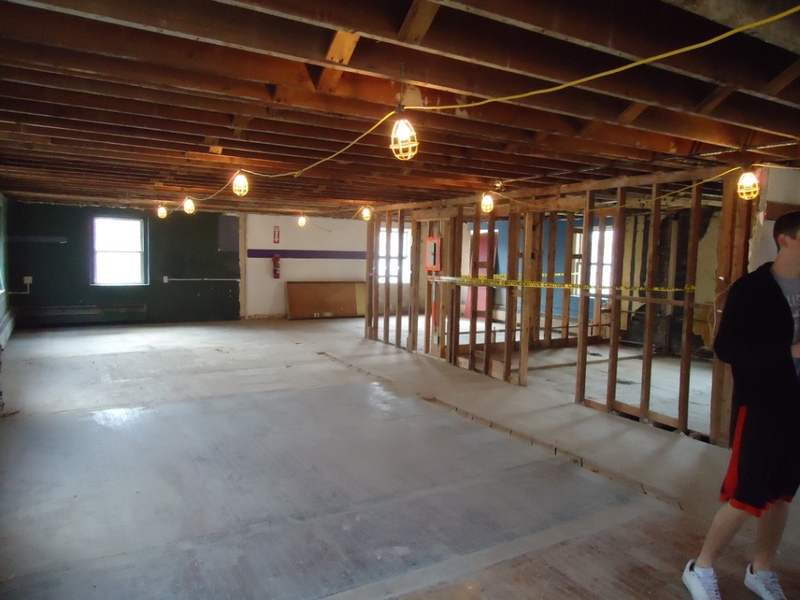 More demo in the basement – what was known as B2 is now gone – the wall between the living area and the beds has been taken down. 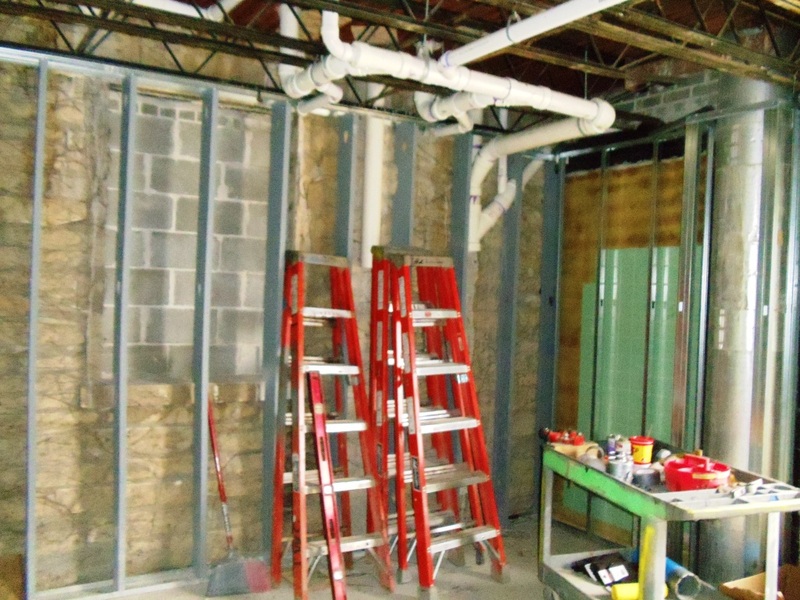 The far back part of the room will become the new electrical service room. 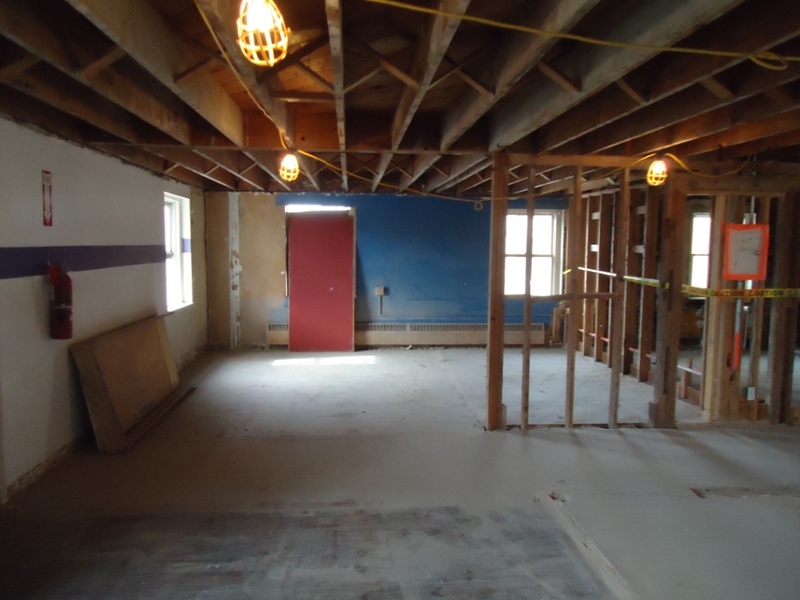 The front part of the room will be a quiet study area and possibly a computer lab. 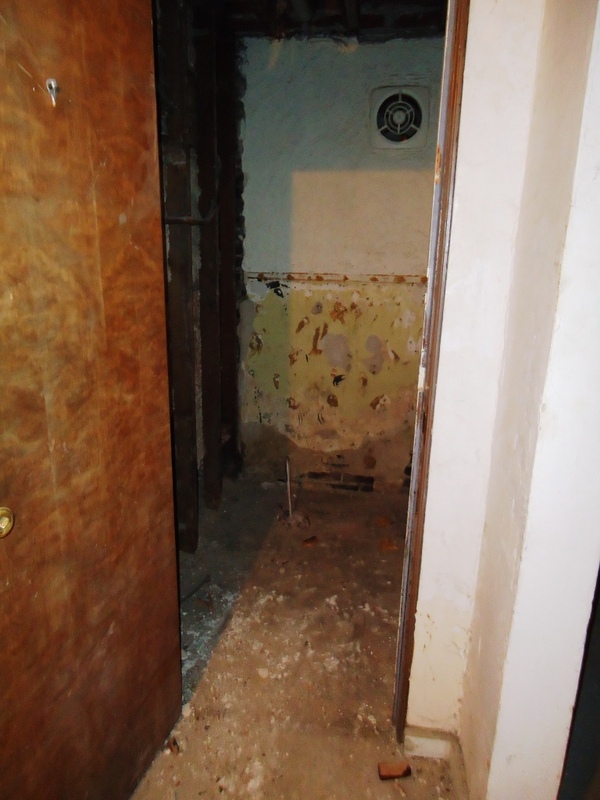 The basement bathroom was cleared and will be replaced with new water-saving fixtures. 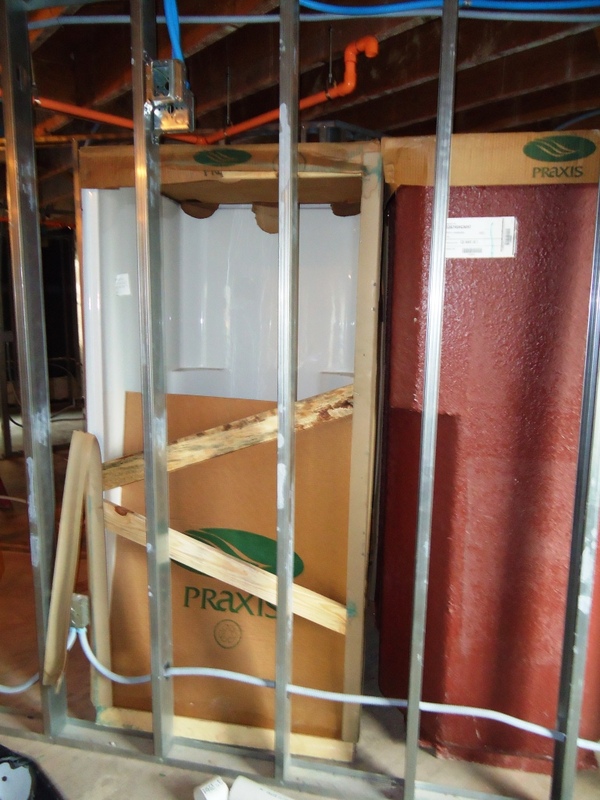 Individual shower stalls will be installed next week in the 2nd and 3rd old bathroom. Each bathroom will have two private shower stalls and a small dressing area. The electrician has been busy installing can lights. The Board decided to use can lights in the rooms and hallways instead of traditional light fixtures. This will avoid the constant battle of replacing broken fixtures. 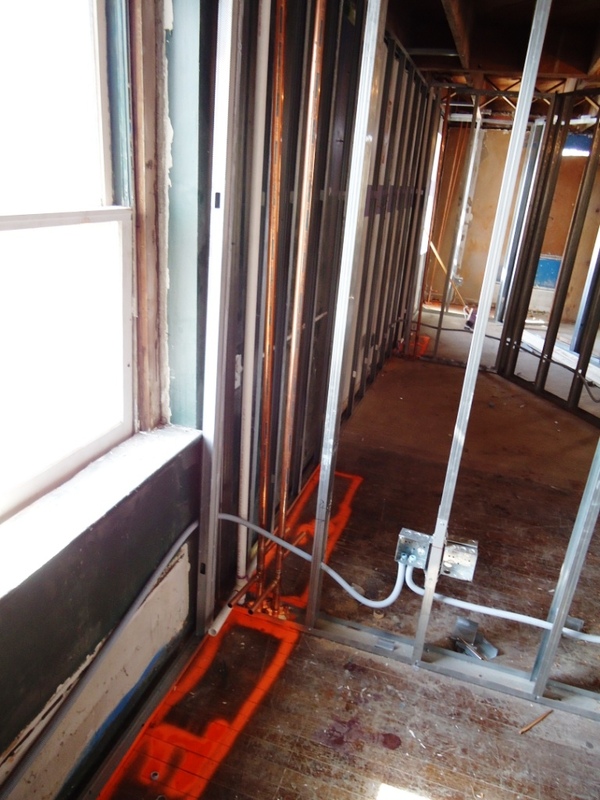 What was Room B2 — standing in the living room — looking to the south (the old electrical panels are on the wall). 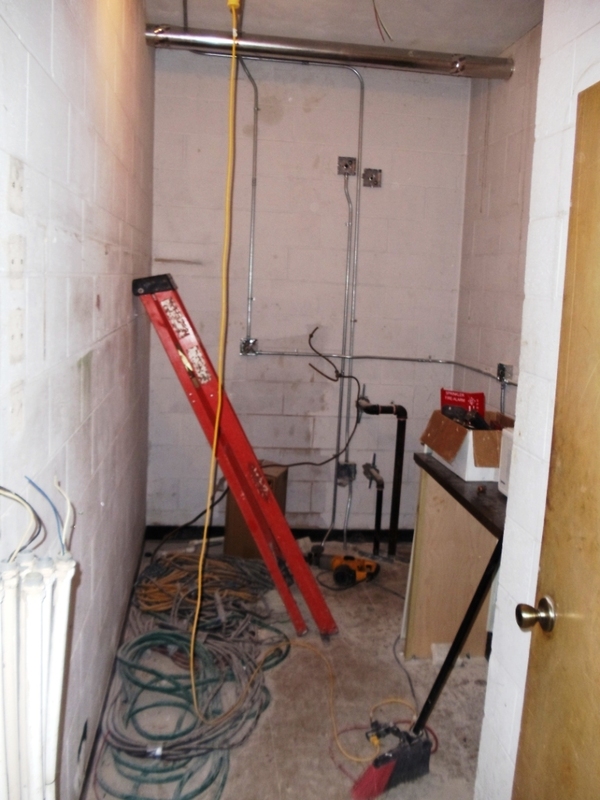 A new wall will be put up in the back to serve as the electrical room. The floor will be leveled where the beds use to be and this will be a new study/computer room. 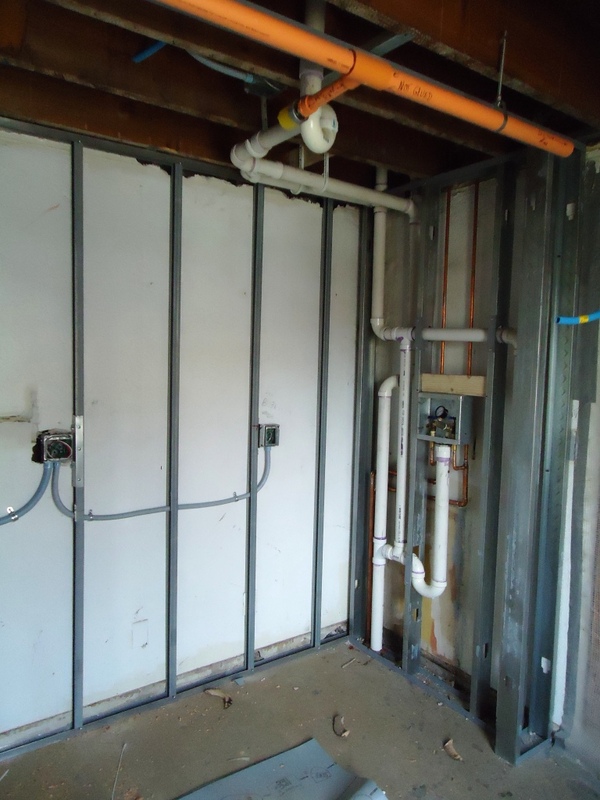 Basement bathroom has been gutted. New shower stalls. These will be installed next week. Can light in the new room 200. Electrical and mechanical rough-ins started this week. The plan is to convert the existing boiler (installed in 1997) to hot water (currently hot water and steam) and install new air conditioning equipment. 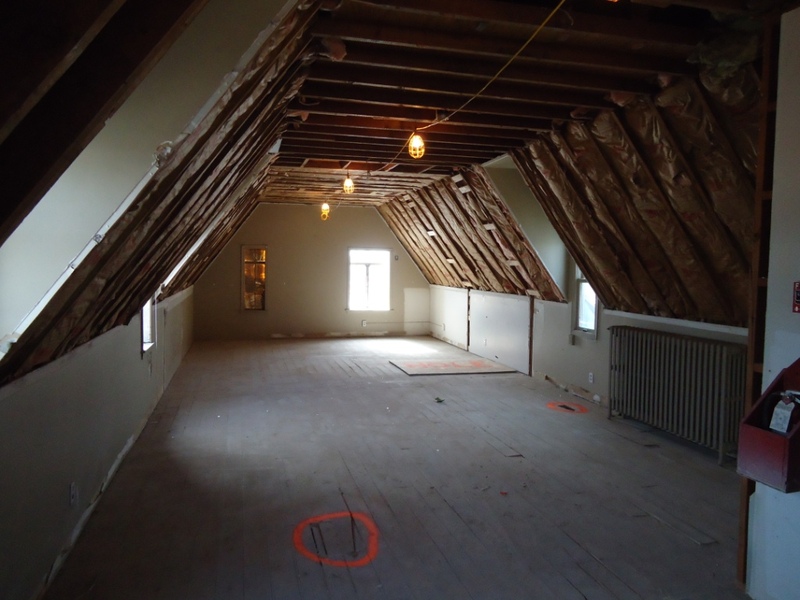 Each room will have their own heating and air conditioning units. 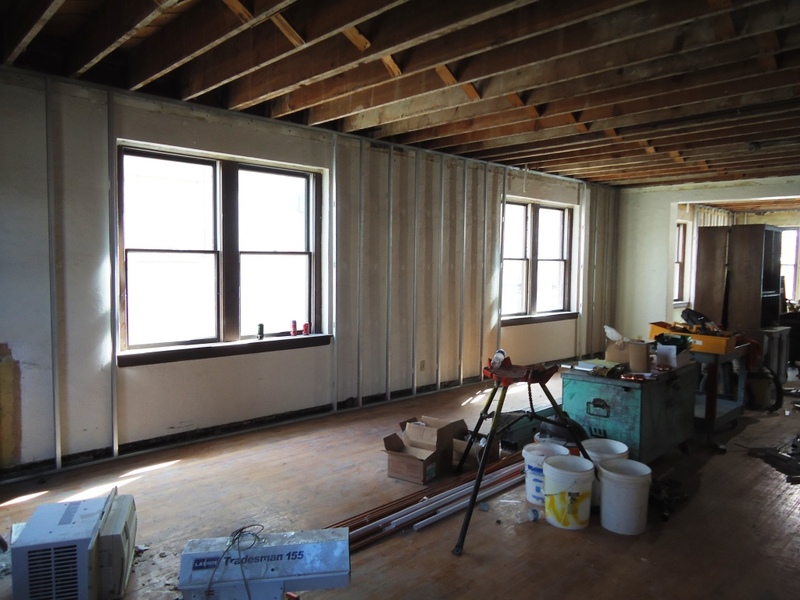 The exterior walls have been furred out to accommodate insulation. This will help with the overall efficiency of the building. 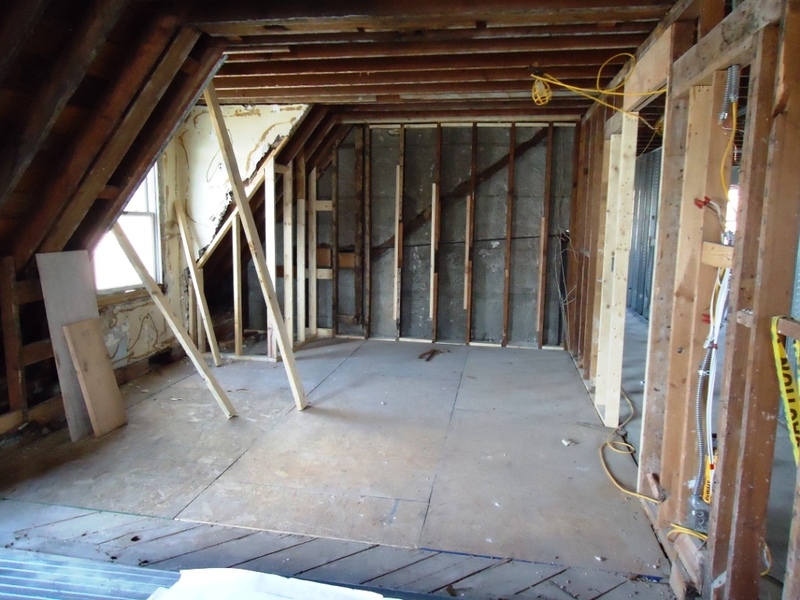 There is currently no exterior insulation, other than air space. In addition, this will allow new wiring to be installed. Asbestos removal continues in the basement. New floor joists were installed in the bathrooms and the floor is down. 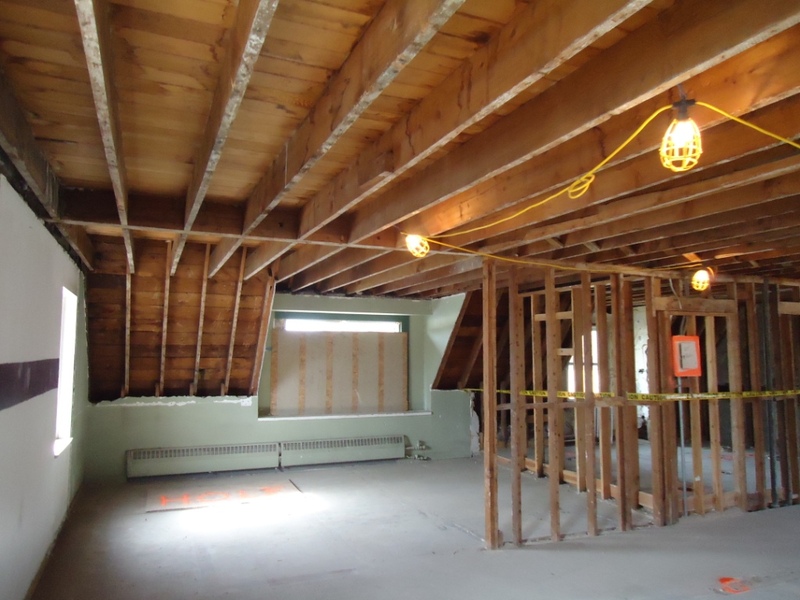 Several of the existing floor joists had significant notches (up to ¾ the width of the joist) cut into them to accommodate different plumbing and remodels over the past 80 years. 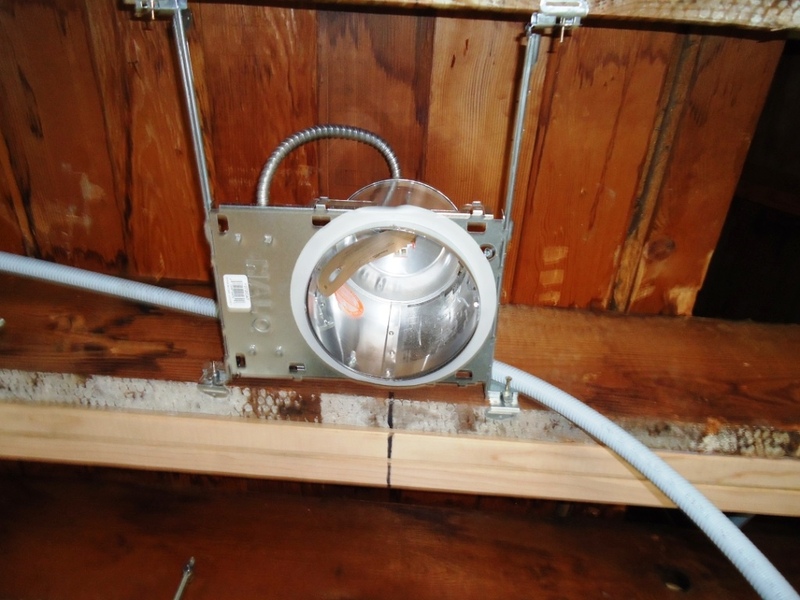 This was not safe to install the new bathroom without taking care of this structural issue. 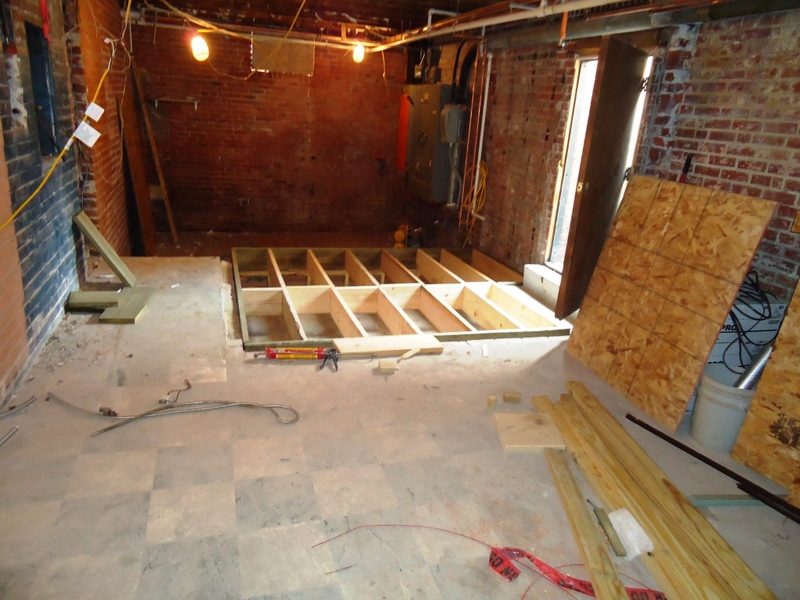 Finally, a new subfloor was installed on the 4th floor. Several of the old floor boards were very thin or cracked. 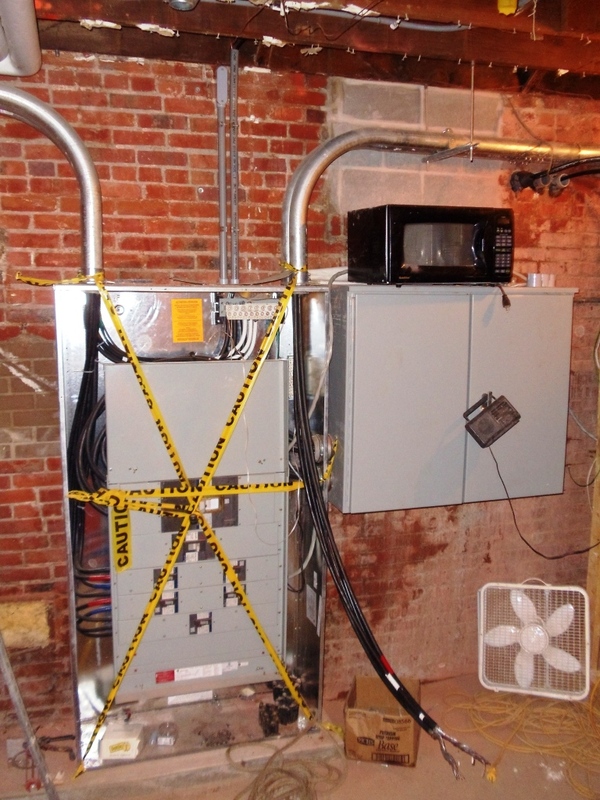 In addition, this separation was required for fire codes. 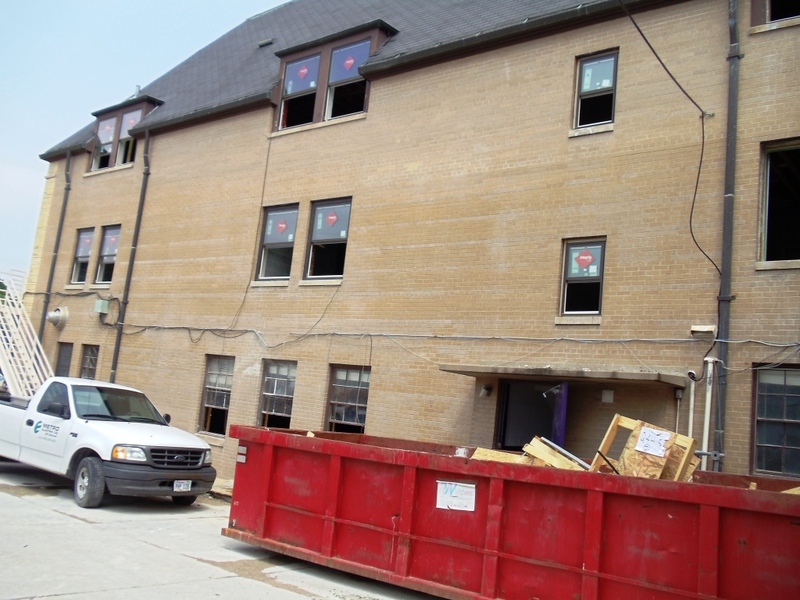 Next week, the windows for the old side should start to arrive and be installed. They are being replaced with a double pane insulated window. The asbestos removal continues – this is the tent set up outside of B2. 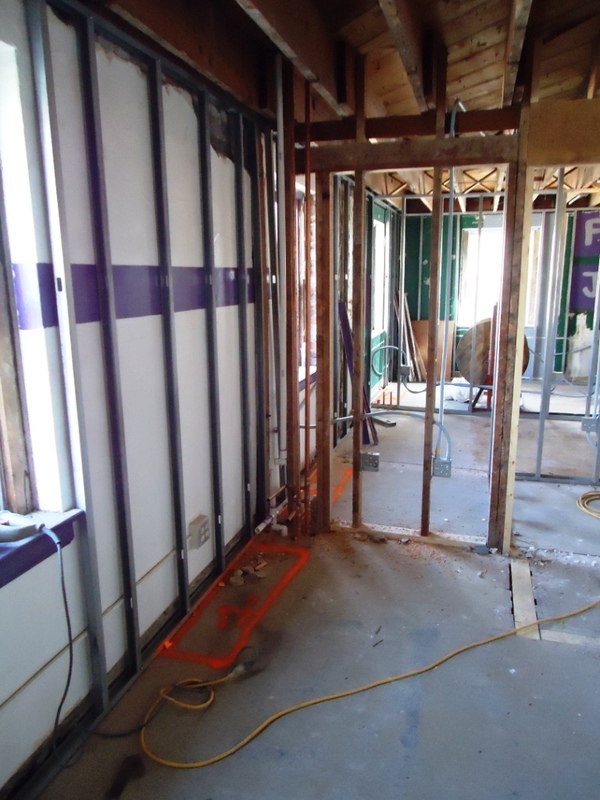 Exterior walls are being furred out to accommodate insulation and provide a tight seal between levels. 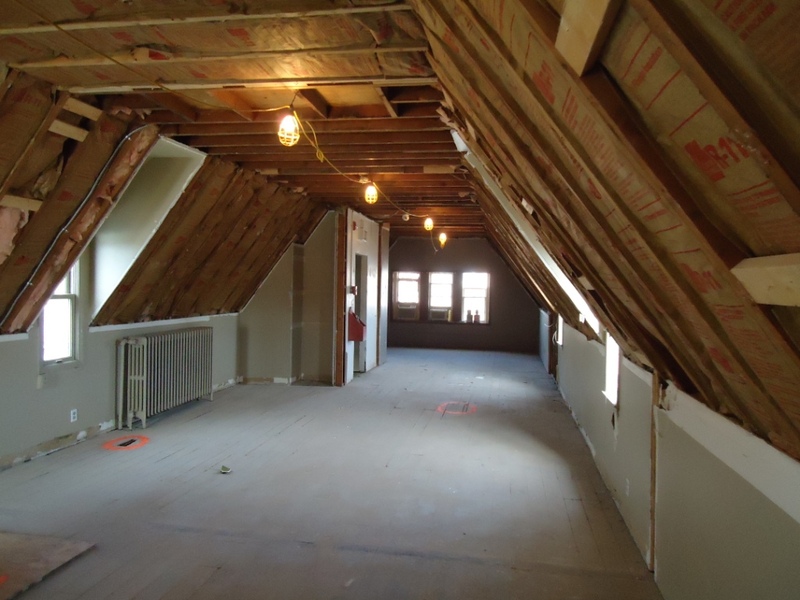 2nd floor — north side — where the hallway continues to the new side. This will be the future site of a laundry room. 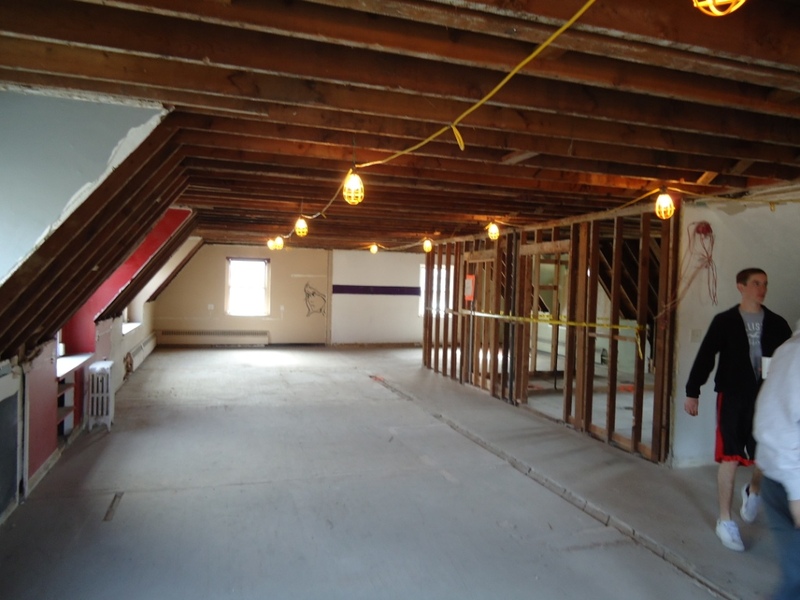 Taken in the new Room 200 — from the educational space looking into the two new sleeping rooms. The new 3rd Old bathroom — the floors have been replaced. Plumbing should be installed in the next few weeks. 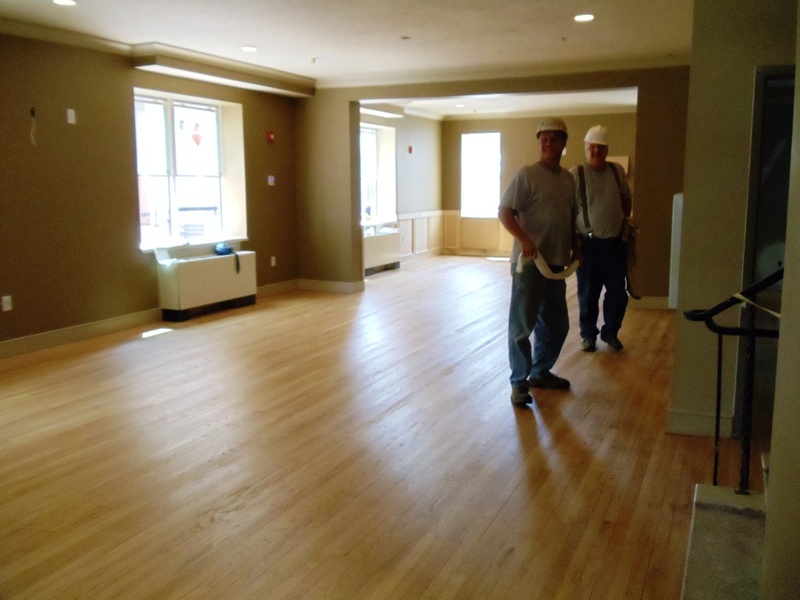 A new subfloor was installed on 4th floor. This is taken on the south wall — right next to the fire escape. The 2nd, 3rd and 4th floor demolition is complete. 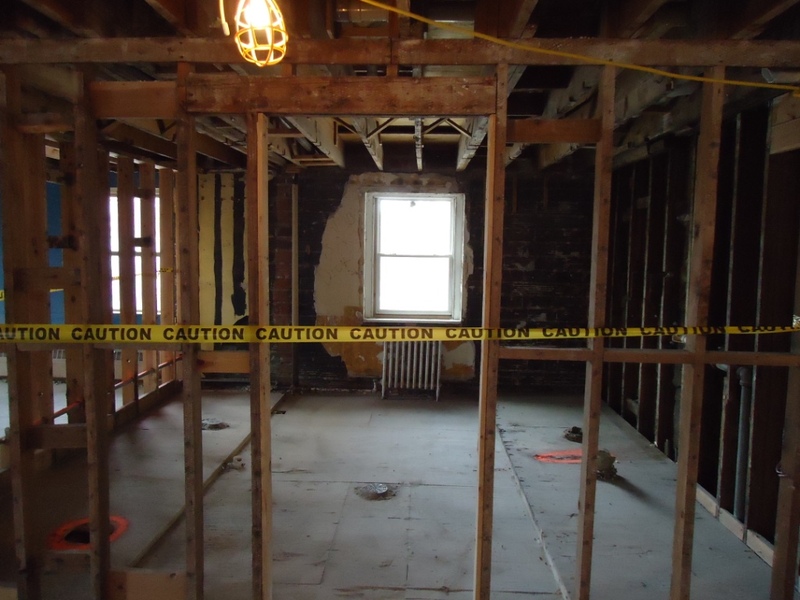 All interior walls, including both bathrooms, were hauled down R Street this week. 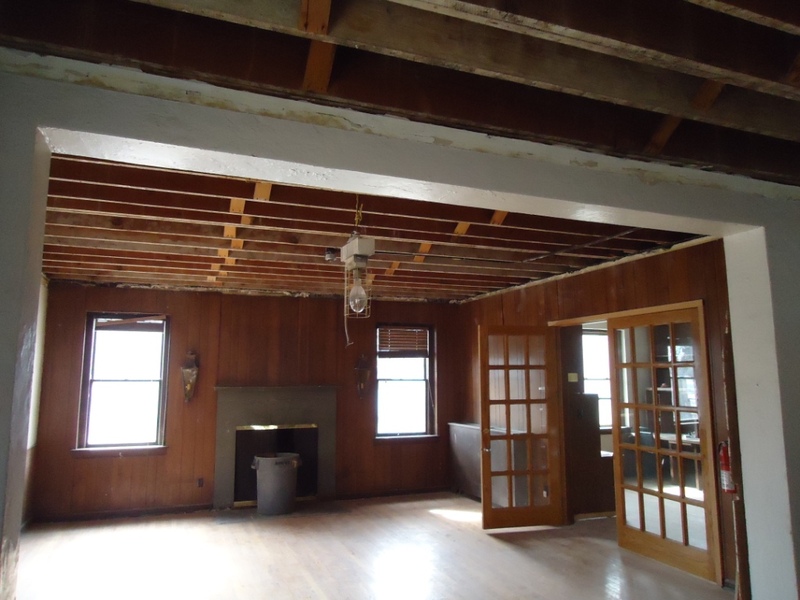 The living room ceiling was taken down to allow for the installation of new electrical, plumbing, HVAC and fire sprinklers. The interiors of rooms B1 and B2 are cleared as well. Next week includes finalizing the permits and the framers plan to start putting up the new walls. 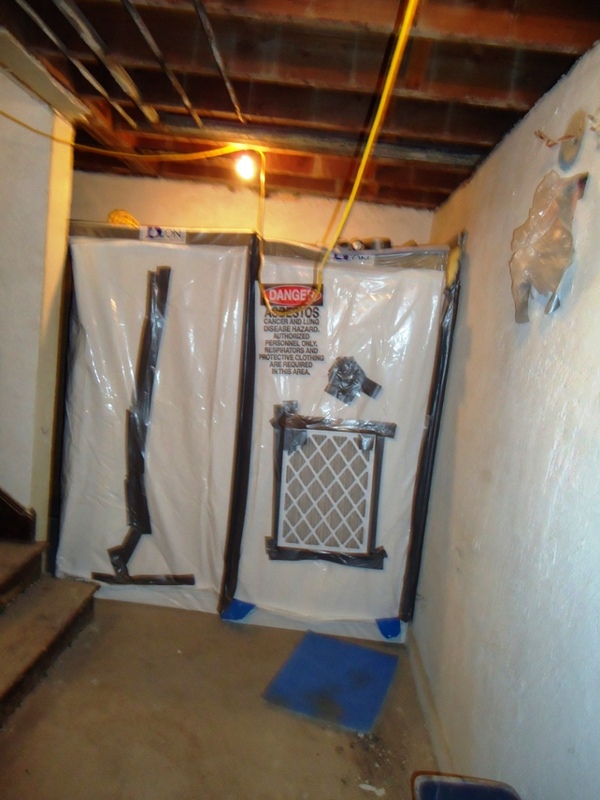 We also have the joy of dealing with asbestos removal in preparation of the HVAC guys starting their work. Livingroom, looking to the north. 2nd Old bathroom — yup, this is a big project. 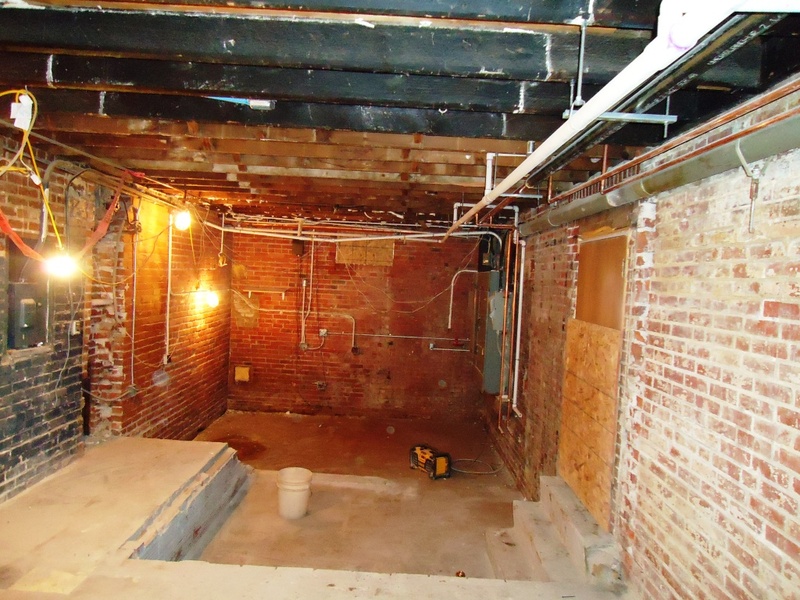 Basement — you really can’t tell much down here — but the ceiling panels have been pulled down and carpet removed.